In the early 1960s, a group of students at Beverley Public School were selected for University of Toronto sports scientist Dr. Frank Hayden's study on the effects of regular exercise on the fitness levels of children with an intellectual disability. His research challenged the prevailing mindset of the day – one that claimed that it was the disability itself that prevented children from fully participating in play and recreation. Through rigorous scientific method, he proved that it was simply a lack of opportunity to participate. Given that opportunity, people with an intellectual disability could acquire the necessary skills to participate in sport and become physically fit. Dr. Hayden’s proposal for a national sport competition caught the attention of Eunice Kennedy Shriver (she started Camp Shriver in 1962 that evolved into Special Olympics), serving as inspiration for the inaugural Special Olympics competition in 1968 in Chicago. Canada was represented by a group of 12 students and a teacher from Beverley Public School as well as Toronto Maple Leafs captain George Armstrong who was the Honourary team captain. 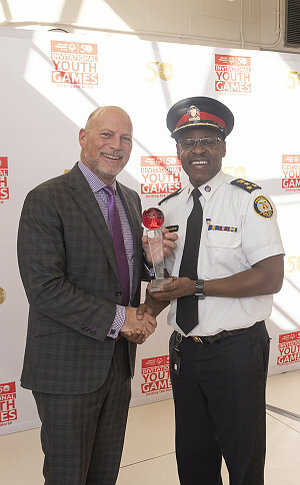 The Toronto Police Service is the host organization and Chief Mark Saunders is the honourary chair for the first Games from May 14-17, 2019 in the city. Nearly 2,000 athletes will compete in track & field, basketball, bocce, soccer and floor hockey. Saunders challenged individuals and the business community to support the IYG draft. “Provincially, the goal today is to raise $50,000 in celebration of 50 years of the movement and we cannot do it without your generosity and support,” he added. A track and field athlete can be drafted for $1,000. Small and large teams can be drafted for $5,000 and $10,000 respectively. The estimated cost of assembling the athletes is $2 million. 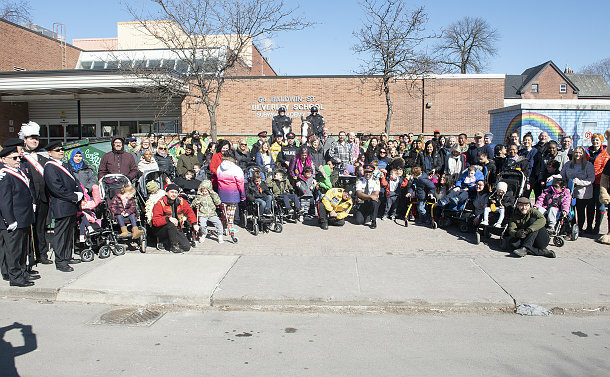 Basil Garrard, the Chief Financial officer and Vice-principal of Special Olympics Ontario, thanked the Toronto District School Board and Beverley Public School for hosting the celebration that was emceed by Farley Flex. “Fifty years ago, the world didn’t appreciate the incredibly positive contribution which the intellectually disabled community could make to our society, “Garrard said. “As you know, through sport, training, fitness, diet and competition, Special Olympics has been able to provide a level playing field of encouragement, friendship, support and inclusion which has allowed the generous hearts of our Special Olympics athletes to demonstrate their capacity for joy, forgiveness, fairness and a much greater sense of self-worth and confidence which, in turn, has led to a fuller participation in Canadian life. 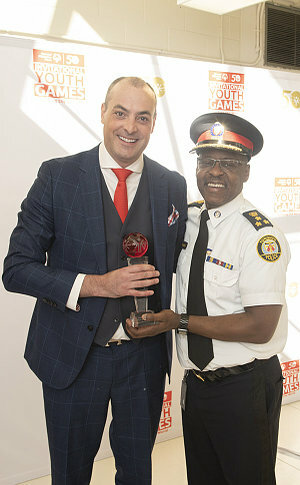 To mark 50 days before the IYG opening ceremony, Toronto Police Services Board Vice-chair Marie Moliner read a proclamation on behalf of Mayor John Tory who is also a TPSB member. Horizon ETFs Management Canada Inc. and BMO Global Asset Management presented cheques for $10,000 and $15,000 respectively to Special Olympics Ontario. The Knights of Columbus presented the 50th anniversary flag to Beverley Public School.